It is believed that every birth on earth has a purpose and only a few realize the purpose of their birth. And when they realize their purpose they become God’s messenger and begin to preach the greatness of Him. The one who gives up their earthly ways to spread the messages, the love of God is considered to be a “Saint”. Vijay TV is very proud to come up with a unique series titled “Mahaan”, a series that brings to us the stories of such saints. Launching on August 02, 2010, the series of the show would talk about the birth, the calling, the sacrifices, the miracles, and the sainthood life undergone by the saint. The series would briefly cover the lives of Mahaans like Sri Ragavendrar, Sri Ramakrishna Paramahamsar, Kanchi Paramachariyaar, Sri Ramana Maharishi, Aadi Sankarar, Vallalar, Mother Vellangani, Nagur Baba and many others. 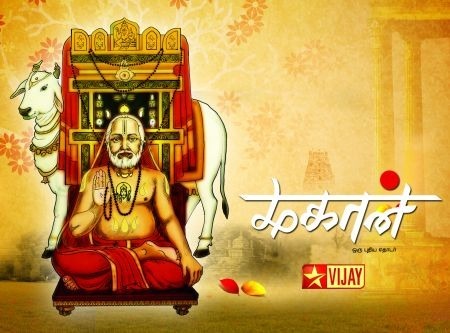 Sri Ragavendrar would be the first saint to feature on Vijay TV’s Latest Serial. Born as Sri Venkanna Bhatta during the 16th century, Ragavendrar learnt to play Veena proficiently and proved to be a very brilliant scholar from a very young age. The series would cover his birth, early life, marriage, learning’s, realization of his calling, his transformation to Sri Ragavendra, the beginning of the Sainthood; his missions and is teachings until his Jeeva Samathi would be a part of this. Beginning from August 02, 2010, tune into the show every Monday – Friday at 6:30pm on Vijay TV. This would be a series that depicts the life of the real saints who truly are a source of inspiration to all.